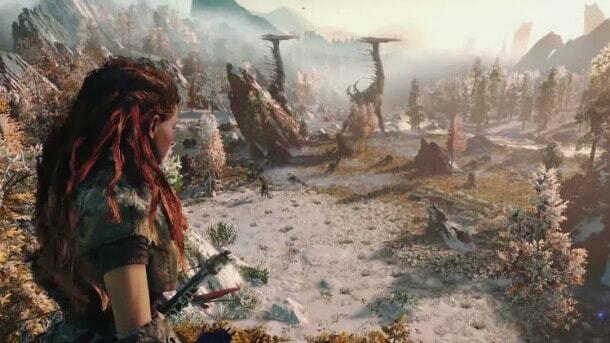 Open world games are here to stay. Nick D. just wishes they didn’t edge out all the great video game music in the process. It’s safe to say that the biggest trend in video games right now isn’t VR, but rather making everything open world. Games like Grand Theft Auto and Red Dead Redemption 2 have shown us the amazing things that can be done in open world games, to the point where websites like RDR2.org are dedicated to documenting some of the crazy things you can do while exploring the open world. This trend spans all genres from RPGs to first person shooters, even going as far as hitting racing games of all things. While there are benefits as well as problems relating to this sudden influx of all things open world, the one that irks me the most as a long-time gamer is the elimination of music tracks in favour of ambient noise. It’s an ongoing phase-out of melodic scores in order to up some feeling of realism in a huge, empty world. It used to be that you couldn’t take a single step onto an overworld without a catchy theme blasting through your speakers. Well, no longer. What’s interesting about this trend is that I don’t even think that this is something that gamers actually want. Although relatively silent games such as Fortnite have instead sparked dance crazes, the actual game itself is sparsely filled with music. The game has been incredibly popular, spawning websites such as Battle Royale Insider dedicated to serving the fortnite community. Video game music has always been integral to the overall experience. Without that telltale five note start, Super Mario Bros. would have lost something despite its obvious great early platforming. But, it’s not just about catchy music that never leaves your head decades later. Video game music has always been used to set the mood and evoke particular emotional responses from players. In Donkey Kong Country, mine cart levels are tagged with frantic and high tension music in order to underscore the all or nothing nature of the level. An entire article could be written about what the different town themes in Final Fantasy IV immediately forecast about your new local. For example, you don’t need to know that Fabul is a country of warrior monks or that Mysidia is a quirky town of mages and pranksters – the music tells you this long before any dialogue does. While some of the great video game themes stem from RPGs, particularly JRPGs, or platformers, it is no less a cornerstone of other, less fanciful genres. First person shooters, for example, have relied on pulse-pounding music to keep gamers energized during constant firefights, or mesmerized during brief calm moments. The Halo series is particularly known for this. The same can be said with games in the racing or fighting genres – really anything that needs to keep adrenaline up or inspire some sort of feeling in the player. This leads to the problem with open world games. Many video game directors use open world in order to envelop gamers in their world, with some games using something similar to trap loop by Producer loops for music. The popularity of the genre and this method dates back to the hugely successful Grand Theft Auto III, which plunked gamers down in a very real-feeling (at the time) living and breathing city. Music took second fiddle to the whizzing cars, chattering citizenry, and the blaring of sirens. With the ability to fully realize a 3D world came the feeling that developers were obligated to make it feel realistic – and there’s nothing realistic about poppy music playing over the ambience. Of course, back then, open world games were few and far between. Budgets and demand wasn’t there yet. Fast forward to today. Open world games are everywhere and they aren’t just the traditional customers. Classic franchises like Zelda, Final Fantasy, and Metal Gear have all decided to throw their hat into the open world game. First person shooters, once tight and level-based, have seemed keen to adopt the open world model with games like Borderlands and Destiny being as open as any Grand Theft Auto game. Even standard third person shooters have gone open world with games like The Division doing its best Destiny impression. The problem is that, while open world games have made serious progress in terms of being so widespread, there hasn’t been much done regarding their notable lack of music. There are exceptions, of course. Xenoblade Chronicles X manages to keep a constant score going, while also having a world so large and full that most open world games look on in envy. Despite the exceptions, however, most open world games follow the tradition of Grand Theft Auto III – immersion above emotion-evoking themes. In some ways, I blame the western tradition of video game music. Traditionally, western games took a more somber or dour approach to video games. A large portion of major western games and game composers follow the film score theory of writing music with a single bombastic theme coupled with small, unmemorable themes around the place that serve only to heighten or release tension. There is no better example of this than the Elder Scrolls Series. The core theme is hummable, memorable and great. Everything else is just there. It all works great, doing exactly what it’s supposed to do, but none of the themes are really going to stick with you. There are of course exceptions to this, but enough western games follow this path to make it a clear trend. This is why Mass Effect has music that feels right out of a movie. The Japanese tradition of video game music is quite different. In this tradition, melodic themes are the standard. Because of Japan’s obvious influence on the development of video games, this has led to this kind of music feeling natural. If western video game music can be considered subtle, Japanese themes are anything but. This is the tradition that booms the main theme every time Link walks outside in the various Zelda games. Or hits you with the wonderfully intense Blinded by Light every single battle you jump into in Final Fantasy XIII. Almost every classic Japanese series is almost defined by its music. Would you even recognize Mega Man without the wildly inventive Robot Master level themes? What about the eccentric mix of horror and blazing 80s tunes that Castlevania brought into the world? You see, by in large, open world games follow in the western tradition of subtle, less melodic music outside of a main theme. For the most part, this is because these games are western developed with major western studios like Rockstar, Bethesda, and Ubisoft’s various development teams churning out open world hit after open world hit. In some ways, this has led to a colouring of how open world games should actually be scored. So much so that Japanese or eastern created open world games regularly follow this approach. What’s unfortunate, however, is that most open world games don’t even run the full gamut of western-style music, favouring cutting out almost everything for ambient tracks. This has recently been noted in Final Fantasy XV. This game is fully scored – by famed composer Yoko Shimomura no less. But you wouldn’t know just by playing it. On the open world, music only kicks in after you’ve been running around for a few minutes. Even then, it’s frustratingly quiet and sparse. Almost insultingly, the game gives you an MP3 player, which you can use to listen to old Final Fantasy music. While I understand why they thought that would be a fun connection to the series’ roots, it completely cuts out the game’s own score from being able to do any work. Worse still, without the MP3 player or the equivalent radio, players will spend hours in-game driving to total silence. One might argue that this is just the way video games are going, and that people would rather have the chirps of birds and the whisk of a nearby breeze instead of some over the top theme constantly playing. I’d say that this simply isn’t true. The 2015 mega sleeper hit Undertale is all the evidence needed to show that old school melodic themes are still as popular as ever. Toby Fox’s masterpiece has led to multiple, massive fan albums and is quite possibly the most covered soundtrack of all time, which is saying something considering it doesn’t have the decades that other major games have on them. Of course, Undertale isn’t an open world game. But the problem is that, as open world games become increasingly prevalent, there won’t be many genres left untouched. That, and there is no reason open world games need to be stuck with such non-existent music. The idea that ambient tracks draw you into the world is manifestly false. There is a time for ambience. It can stop all action in its tracks and force you to really take heed of your surroundings. Silent Hill, as a series, does this very well. However, all ambience all the time undermines the times where the game needs to be silent. The main reason that open world games need to start expanding their repertoire and stop fitting in an old mold that never really made a lot of sense is that doing so deprives the world of such masterful tracks as Chrono Trigger’s Corridors of Time, or Donkey Kong Country’s Aquatic Ambience. These are themes that will continue to be listened to for decades after the last person forgot about the cacophony of drums and bass that make it into most open world themes, if they even get that much. What’s the biggest tragedy of this trend of ambient open world games in the place of traditional games an their music, is that adopting the more melodic tracks would actually help open world games stand out. As it stands, there is very little difference between random fantasy world A and random fantasy world B, and many open world games are being accused of being bland with Final Fantasy XV and Dragon Age: Inquisition being recent examples. Memorable themes done by good composers that are given actual screen time would go a long way in remedying this.